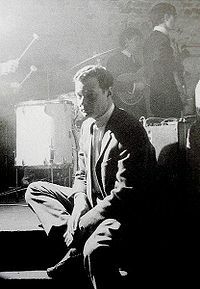 Brian Samuel Epstein was born on September 19th 1934 in London. He died tragically on August 27th, 1967 also in London…and though he was fabulously successful, having discovered and launched THE BEATLES, he was a lonely, depressed man. 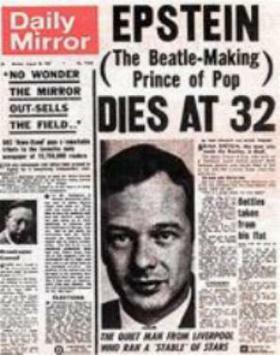 Brian Epstein discovered THE BEATLES..arguably the greatest single phenomenon in pop music history. He also handled Gerry & The Pacemakers…Billy J. Kramer and The Dakotas…Cilla Black and The Cyrkle…all hit makers in their own right. Just the fact that he discovered THE BEATLES is certainly reason enough to honor Brian Epstein by inclusion into the Rock n Roll Hall of Fame. But “Eppy”, as he was called was not only their manager and confidante, but also a man of great vision. His accomplishments were many. By booking THE BEATLES on the Ed Sullivan Show, he launched their careers into the stratosphere. When THE BEATLES took the stage in 1965 at Shea Stadium, the mega business of the ROCK SHOW as we know it today was born. No one had ever played to such an audience and it was Epstein who saw the amazing potential such a venue could have. 1964 may have been a very innocent time in terms of money and business arrangements but in that very primitive time Epstein broke ground and achieved amazing things. He went places NO ONE had ever gone before. Indeed he did things in the rock n roll world that NO ONE HAD EVER THOUGHT ABOUT BEFORE. He was a man of class, fairness and dignity, even though his private life was a dark and dangerous path. Here is what George Martin has to say about Brian Epstein. Derek Taylor said this about Brian. I believe Brian Samuel Epstein belongs in the Rock n Roll Hall of Fame. If you agree please visit http://www.BrianEpstein.com and sign the petition to have Brian inducted into the Rock n Roll Hall of Fame. This entry was posted in Bio, Music, Pop culture, The Beatles and tagged Beatle, Brian, Brian Epstein, Ed Sullivan Show, George Harrison, London, Paul McCartney, Ringo Starr, Rock and Roll Hall of Fame, Shea Stadium. Bookmark the permalink. I went right over to the website and signed. I agree 100%. Some non-manager manager he turned out to be! Brilliant! I remember reading about the moptop hair styles, Astrid, the matched outfits, mostly suits. Considering these four “kids” were on the cutting edge of music, Epstein brilliantly made them appeal to the general public. He definitely deserves the honor, and I am glad to do my part. This one is a no-brainer to me. No Brian Epstein no Beatles. He discovered them and more than that he had tremendous faith in them when the various record companies couldn’t care less. In that respect HE changed the world before they did. on a tangent from my original story but interesting nonetheless!